The best-known legends surrounding the early days of the City of Angels involve water and Hollywood, with both intersecting dramatically in the film Chinatown. 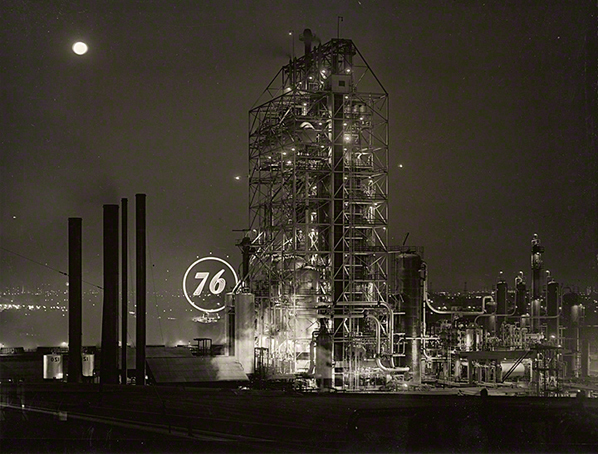 However, as the exhibition Overdrive: L.A. Constructs the Future, 1940–1990 reveals through a collection of luminous photographs and historical notes, the oil industry was one of the major engines of innovation that played a fundamental though perhaps overlooked role in the rapid growth of Los Angeles. As a native of Southern California, this realization intrigued me. I suppose I’ve always been aware of the presence of the oil business in L.A., but only out of the corner of my eye. The skeletal derricks and stalwart pumpjacks on hillsides and city streets—ordinarily bizarre sights—blend into the scenery of everyday life here, becoming so familiar they’re often ignored. The fact is that since the 1890s the city has been literally and figuratively built upon acres of ancient oil deposits deep beneath its shifting surface. 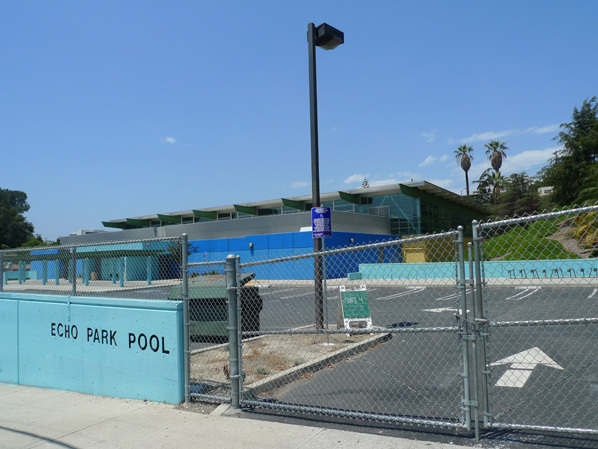 The first successful L.A. oil well was drilled in 1892 by Edward Doheny, who tapped the Los Angeles City Oil Field on the site of a present-day swimming pool center in Echo Park, setting off an oil and population boom. 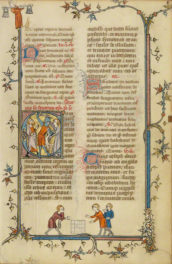 Since then, the financial resources generated by the petroleum industry in Southern California, through corporations such as Union Oil, Getty Oil, and Atlantic Richfield, have fueled the growth of our car culture along with the automobile, aerospace, and other industries entwined with L.A.’s identity. Today the oil fields of Los Angeles continue to produce the bubbling crude with extraction equipment that informs L.A.’s built environment. A surprising number of oil derricks are hidden in plain sight, designed and architecturally camouflaged with windowless façades of office buildings, like movie sets on busy boulevards. The patchwork of oil and natural gas deposits in California covers a vast area reaching from Southern California to Central California, but Los Angeles is home to the most urban oil fields in the United States, according to the Center for Land Use Interpretation (CLUI). More than 3,700 derricks extract oil from about 55 active oil fields in the Los Angeles area alone. If you look closely while traveling around town, you’ll notice telltale methane vents on curbs and the incognito buildings that house pumps in neighborhoods and even in shopping centers. The more obvious oil wells sit in backyards, like those on Signal Hill and various hillsides. 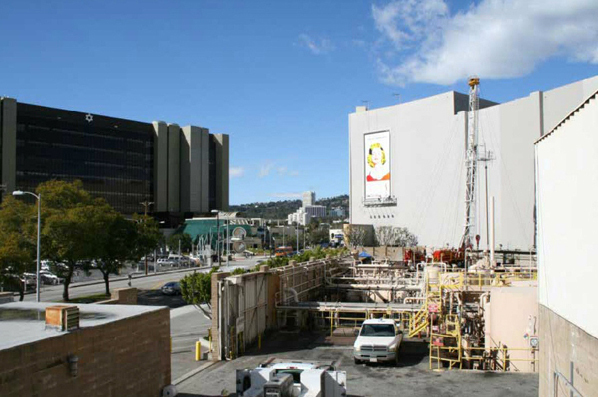 To the west, the Sawtelle Oil Fields stretch beneath the Veterans Administration land with 18 operating wells near the 405 Freeway. 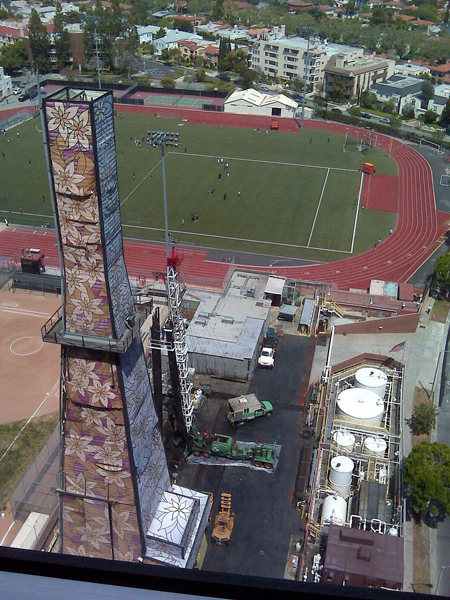 Moving east, the Beverly Hills Oil Field covers an area in West Los Angeles near Pico and Olympic Boulevards that includes the Venoco Flower Tower and other sites. For years, the nearby backlot of Fox Studios was home to a drilling island until it was abandoned in 1990. 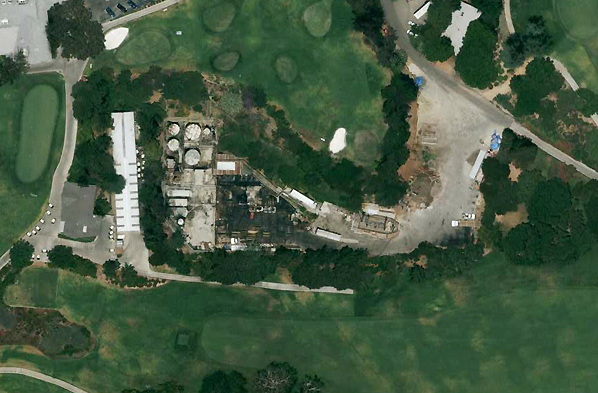 The Rancho Park Golf Course and the Hillcrest Country Club, whose members once received royalties from oil revenue, have hosted pumps onsite that draw from the Cheviot Hills Oil Field. 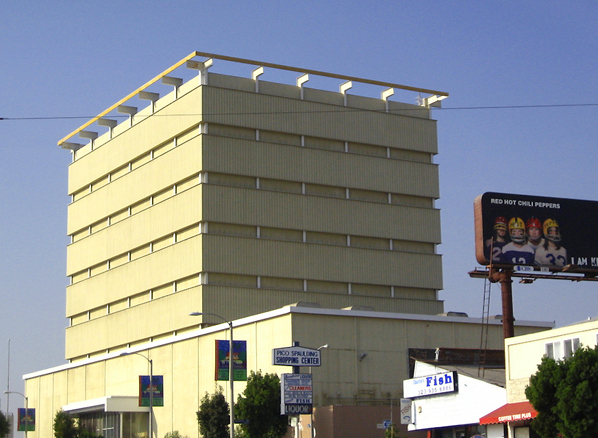 To the east, the Salt Lake Oil Field lies underground near Cedars Sinai Hospital and the Beverly Center shopping mall. 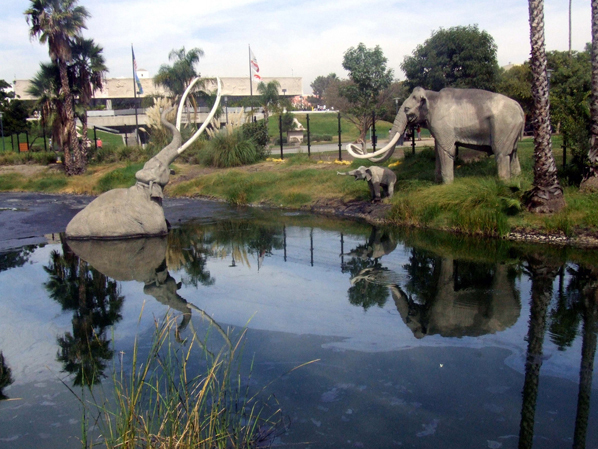 It extends to the prehistoric La Brea Tar Pits, which still ooze tar (actually, asphalt) on the park’s walkways and grassy areas, but no oil. In close proximity to the tar pits, the Los Angeles County Museum of Art was designed and built with consideration of the gaseous goo, the perfect preservative for bones of ancient saber-toothed tigers and other extinct creatures. 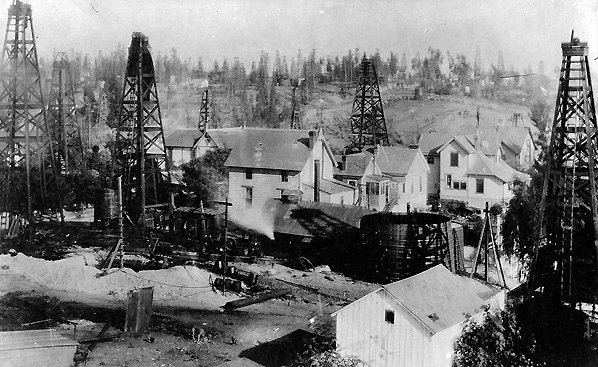 First discovered in the 1890s by dairy farmer Arthur F. Gilmore while digging for water, the Salt Lake Oil Field became the source of the Gilmore fortune as derricks studded the family farmland near Fairfax and Third Street. By 1910, Gilmore stated prophetically, “Someday you will own a horseless carriage. 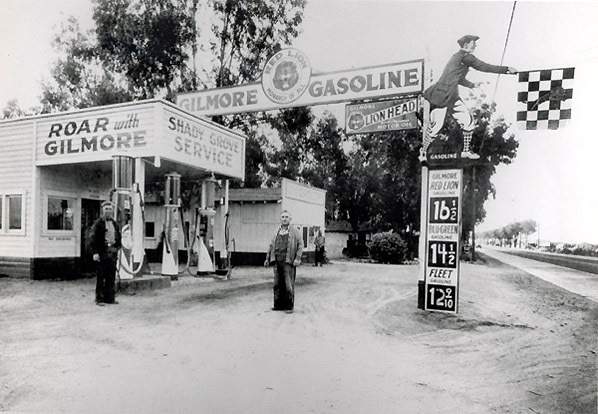 Our gasoline will run it.” By the 1930s, the wells were gradually replaced by the Farmer’s Market, Gilmore Field and Stadium (no longer there), and the Pan Pacific Auditorium (no longer there), and then later by CBS Television City and The Grove shopping complex. Further east, the Las Cienegas Oil Field reaches from La Brea Avenue to downtown. But the largest remaining oil-producing reservoir in Los Angeles is the fabled Inglewood Oil Field beneath Baldwin Hills to the south. First discovered in 1924, it traverses a nettled stretch of acreage in the hills above Culver City and Inglewood on the way to and from LAX. This desolate area is home to several oil company operations and has served as an atmospheric location for the films L.A. Confidential, There Will Be Blood, Beverly Hills Cop 2, and Armageddon, as well as for various television series. While L.A. oil wells are still productive and profitable, many of the original sites have been depleted over time and abandoned. Most of the wells of early Los Angeles that drew from the Los Angeles City Oil Field, beneath City Hall and Staples Center, have since been exhausted. When that happens, costly clean-up and remediation must take place before redevelopment of the land can occur. 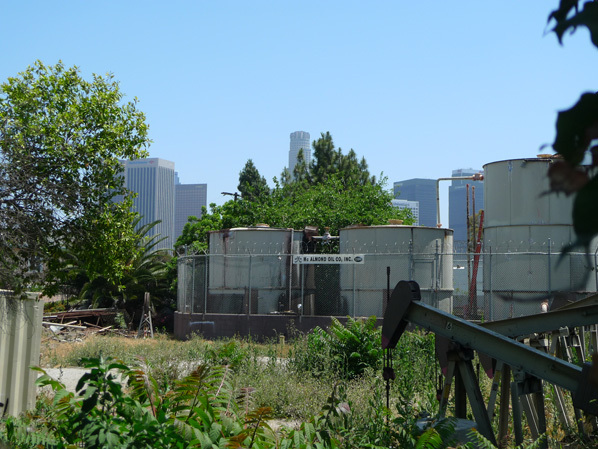 Former drilling site owned by McAlmond Oil Company near downtown Los Angeles. Phillip McAlmond, an independent oilman, operated ten wells here. Other problems have accompanied the bounty of oil, too. In 1985, a fiery methane gas explosion at a shopping complex across the street from the Farmer’s Market prompted the capping of wells. In 2003, lawsuits were brought against Venoco, Inc., with claims of increased cancer rates related to the drilling island at Beverly Hills High School, but were later dismissed. For projects such as the Westside subway extension, methane and hydrogen sulfide gases from petroleum reservoirs have required special tunneling techniques and planning. 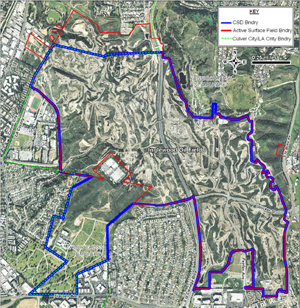 More recently, residents of Baldwin Hills near the hilltop oil fields protested fracking (hydraulic fracturing) by PXP, reaching a regulation agreement in 2011, even as oil companies continue to seek new ways to mine the cache of oil and natural gas found in Southern California. There’s much more to the big story of Los Angeles oil—not least including questions about environmental damage and alternative energy. 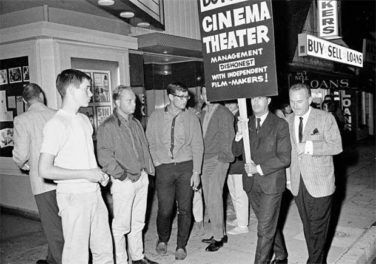 But regardless of the contemporary issues swirling around fossil-fuel production, for L.A., petroleum was a force that propelled a young city into its future. Closing July 21, Overdrive: L.A. Constructs the Future, 1940–1990 showcases Los Angeles’s complex urban landscape and diverse architectural innovations. This is a real eye opener. Very good. how much oil does LA consume alone a year? Thanks for your question. There are numerous sources for consumption statistics. One might be the U.S. Energy Information Administration, which estimated the U.S. consumed 6.87 billion barrels (18.83 million barrels per day) in 2011. It may also provide statistics by state and county. You might get more specific stats for Los Angeles in other city and county records. I hope you find the information you’re looking for. Do tell us the meaning of “nettled stretch.” Is that a new kind of irritable yoga? Thank you! I was trying to answer my 11 yo son’s question about the strange building at pico and genessee when we found your article. Is there a public online catalog of these structures? I remember parts of the story behind some. Can’t decide whether I can face more knowledge about the health and environmental issues, not when I live n the midst of it. Is there a local impact on seismicity? I live in the neighborhood of Beverly Grove, between the Beverly Center and The Grove. There are two tar pools (asphalt?) coming up out of the ground at the corner of West Third Street and South Flores. Which department of the City of LA do I call about this? I wonder if it’s a methane hazard?